Most of the time, bunions can be managed without surgery. Non-surgical options like wearing comfortable footwear, bunion pads and splints, custom orthotics and pain killers can alleviate bunion pain and discomfort. Unfortunately, these treatments cannot prevent or stop a bunion from getting worse over time. A bunion is a foot deformity that commonly affects women mainly due to wearing tight pointy high heels, placing the foot into an awkward position. Eventually, the structures of the foot weaken, forcing the joint between the big toe and first metatarsal bone to deviate outwards. Bunions can also be hereditary. This is the reason why bunions can sometimes be seen even among very young children. Bunions can cause mild to severe pain. Since the joint of the big toe is no longer in its normal anatomical position, simple daily activities like walking and running can irritate the bunion. Also, the bunion can rub against the insides of your shoe, or worse, an accidental bump can happen while you are walking or just moving around barefoot. When is it time to consider surgery? Bunion surgery is indicated when all the non-operative treatments are no longer effective, leaving the patient in constant pain and can no longer function normally or do daily activities. Bunion surgery is the only way to permanently treat a bunion. The aim of bunion surgery is to correct the alignment of the big toe joint to relieve pain. There are different surgical techniques to treat a bunion and minimally invasive bunion surgery or no scar bunion surgery is the preferred surgical procedure to date. Minimally invasive bunion surgery involves a very small incision, about 3 to 5 mm, which is barely visible when completely healed. With the help of live x-ray for guidance, the surgeon cuts the bone, usually around the neck of first metatarsal bone and is carefully aligned and pinned in place. Pain and swelling is very minimal, in fact, some patients can walk a day after the surgery. 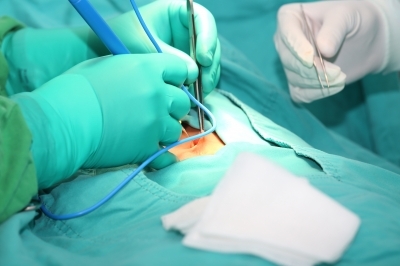 This procedure is outpatient basis, meaning the patient can go home the same day after surgery.